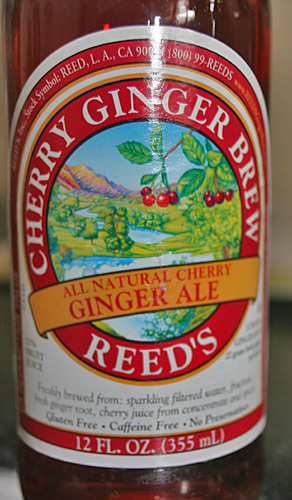 I love Reed’s Original Ginger Brew Ale. I love it so much that I don’t even call it soda, I call it Reed’s. It usually goes like this: a friend asks for a soda and I say I don’t have any soda, but I have a Reed’s. I like Reed’s Ginger Ale for the fact that it’s not full of garbage. Just natural heavenly good stuff that makes a mean ginger brew. So I decided to try out their Cherry Ginger Brew Ale. And I have to say, it’s only okay. Don’t get me wrong, it is still waaaay better than most sodas but this particular Ginger Brew is not their finest work. Maybe I’m just too stuck in my ways and I prefer the more traditional version of a ginger ale. I didn’t like that the cherry covered up my punch-in-the-face-with-ginger taste. The ingredients for Reed’s newest addition to their Ginger Brew journey are: sparkling filtered H2O, fructose, 22 grams of fresh ginger root, cherry juice from concentrate, and spices. I really like that they put in fresh ginger root and lots of it. Very natural and tasty. Should I let you know what’s in a Canada Dry Ginger Ale? How about this: Carbonated H2O, High Fructose Corn Syrup, Citric Acid, Natural Flavors, Sodium Benzoate (Preservative) and Caramel Color. MMMmmm, tasty. So which do you think would taste better? The one that actually has ginger root as an ingredient or not?